A new product by the makers of Calendulis Plus Cream. The GN Kids Eczema Body and Bath Oil is designed to be used with the GN Kids Eczema Cream. GN Kids Eczema Body and Bath Oil is a natural eczema oil especially formulated for young skin. It contains moisturising ingredients to help soothe and calm the skin. Avaliable in a handy 100ml plastic bottle. For the relief of Eczema, Dermatitis, itchy and dry skin. Apply 2 – 3 times a day directly to affected areas. Alternatively add a teaspoon or two to a bath of luke warm water and soak for 10 – 15 minutes each day. Dab the skin dry then apply the GN Kids Eczema Cream. If symptoms persist seek medical advice. As with any product being used for the first time I recommend the GN Kids Eczema Body and Bath Oil be patch tested on an unaffected area before being used on the affected areas. 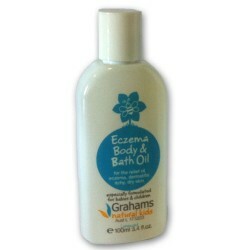 For best results use with Grahams Kids Eczema Cream. Inactive ingredients: Olive Oil, Sunflower seed oil, Jojoba oil, Avocado oil, Squalene, Caprylic/capric triglyceride, Bisabolol, D-Alpha Tocopherol. Bath oil may make the bathtub slippery so be careful when entering and exiting the bathtub. For external use only. Do not take the product by mouth, and do not let product get into eyes. If product gets into eyes, flush with water until it is out and consult your physician if necessary. If redness, irritation or other reaction develops, discontinue use immediately and consult your physician. Proving to be a popular product as it has minimal smell, goes on easily and leaves the skin feeling soft with a light protective film.